This month the Expressions Vinyl ambassador team was asked to create a kitchen themed project. I’ve had my idea brewing for the past few months (actually since July when I got the assignment), I had planned to make a cute little Christmas apron using this pattern, with a heat transfer vinyl holiday sentiment ironed on the pocket. Well wouldn’t you know since I was a bit pinched for time this week after just getting home from a trip, the one coordinating piece of HTV I had on hand, went through a tragic cutting accident leaving me empty handed (serves me right for trying to get something together last minute). Quickly I had to move onto plan B (however I hadn’t thought of plan B since plan A was so awesome), so I settled for a trusty sign, they just never fail me. This Mrs. 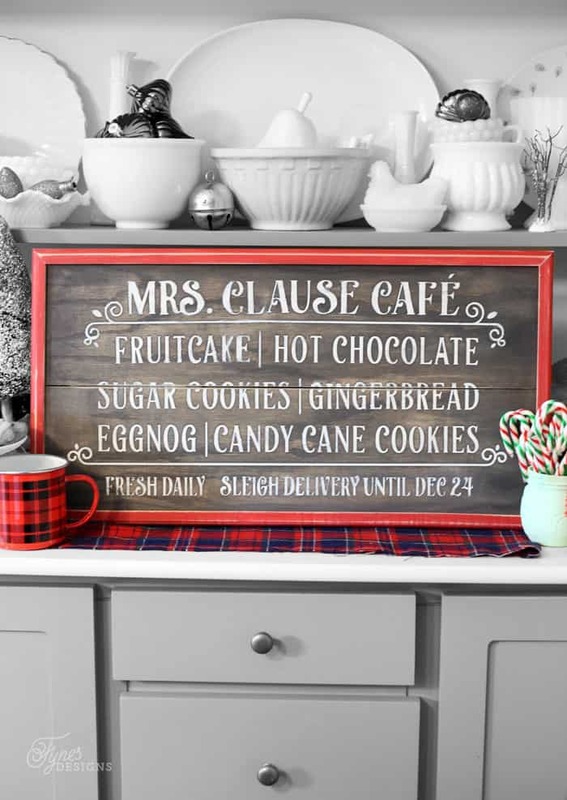 Clause Cafe Christmas kitchen painted wood sign is sure to warm your holiday loving heart, and make you crave all those delectable December treats! Mrs. 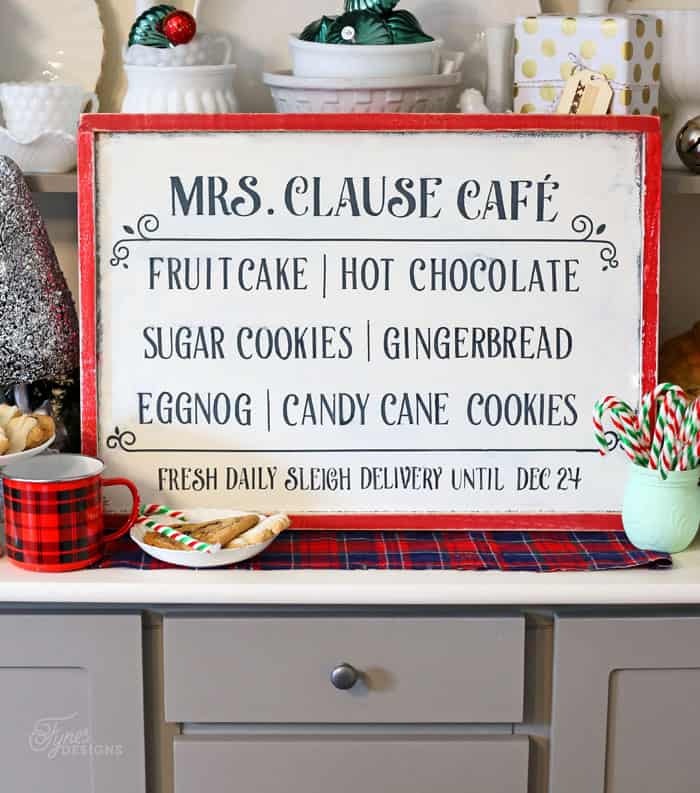 Clause Cafe is open for Christmas customers! When I use vinyl to create a painted sign (which btw is the easiest way to get crisp clean lines) I really like to maximize the use. Yes, tedious but I can get two, (sometimes more if I’m careful) beautifully painted signs from one piece of vinyl. I like to have an Expressions Vinyl grab bag on hand to get an amazing bang for my buck! Using a low tack vinyl like Indoor removable vinyl like Oracal 631, I first cut my design. I peel the positive letters one by one and adhere them to the sign, using the straight edge of the vinyl sheet as a guide to place them on the board. 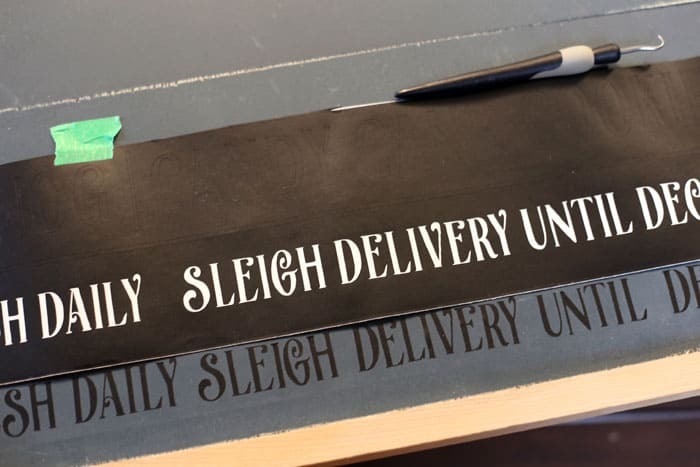 Once all letters are in place, I then use transfer tape to place the negative part of the vinyl design onto an additional sign. Two signs, one piece! The sign on the left with white lettering was created using the negative vinyl, where you stencil the paint into the letter holes. This second sign on the left was created by adhering the positive letters (like in the above photo), painting over the entire background, and then removing the vinyl letters. 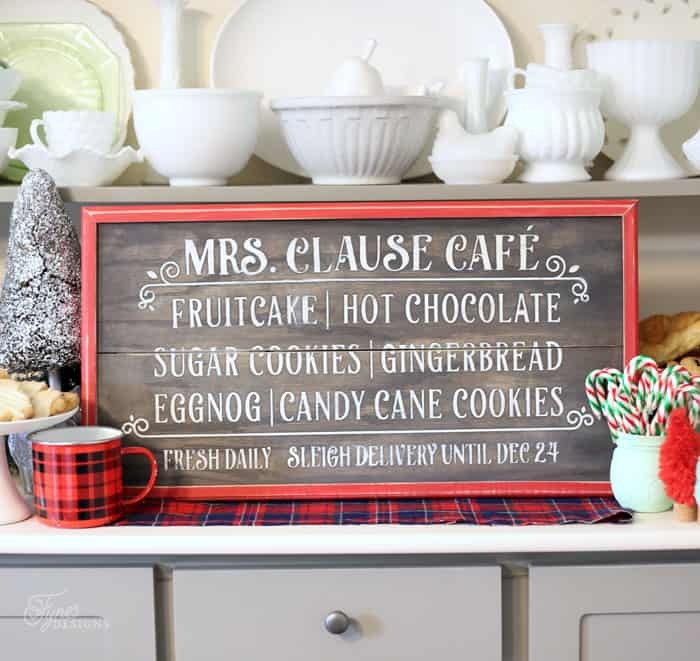 Wouldn’t this little sign make the perfect addition to your Christmas kitchen? I have the perfect spot mapped out for mine… now which one to keep? Disclosure: This project was sponsored in partnership with Expressions Vinyl, all project ideas, and opinions are my own. Enter to WIN a Expressions Vinyl $50 gift card! Love you signs! So beautiful and fresh! What type of wood do you usually use for your projects? Thanks! nothing particular, just scraps, but spruce if I’m paying for it, and plywood if it is free, because its smooth and easy to paint on! 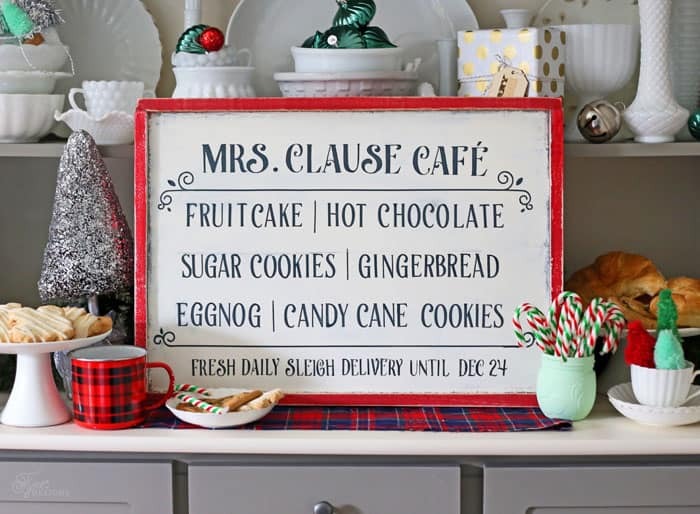 I love this sign, but I have to ask…why did you misspell Mrs. Claus’ name? Was there a reason you spelled it ‘Clause’? I think because I’m Canadian, I think I see it spelled that way often! Love how this turned out! Thank you for sharing with us at Snickerdoodle Sunday! Awesome idea for the Kitchen 🙂 Thank you so much for sharing. Thank you so much for featuring it! I loooove this! I think an apron is a brilliant idea, although the sign is way cute. Thank you so much for the free cut file. Is it possible to make a file with the spelling as Claus, rather than Clause? Love this sign and would like to get the download so I can make it too!